It ends with a bang! 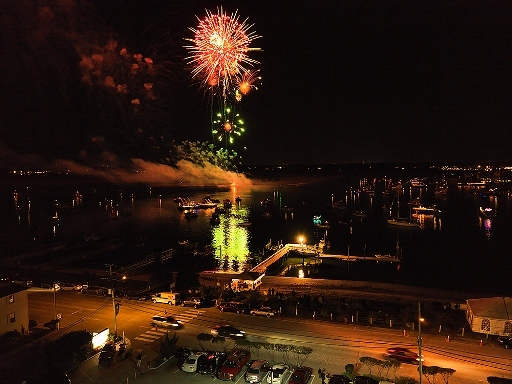 One minute of fireworks for every year the North Carolina Holiday Flotilla has sponsored its lighted boat parade in Wrightsville Beach harbor. Now in its 27th year, the fireworks extravaganza is the highlight of a weekend of family fun and entertainment for all ages, Nov. 26-28. Wrightsville Beach, the flotilla’s home port, entertains more than 50,000 people who visit the town on Thanksgiving weekend. On Friday, November 26, Santa and Mrs. Claus arrive at dusk (5:45 p.m.) for the Town of Wrightsville’s annual tree and town lighting, and Toys for Tots gift collection. Also Friday at 7 p.m., the official Anchors Away Launch Party kickoff begins at the Blockade Runner Beach Resort. Special musical guests, The Four Knights, will entertain until 11 p.m.
Saturday, November 27, from 10 a.m. to 4 p.m., Day in the Park activities blanket Wrightsville Beach Park providing a classic car show; kid’s games; magic acts; the Arab Choo Choo ride; live bands; art, craft and food vendors. Admission is free. 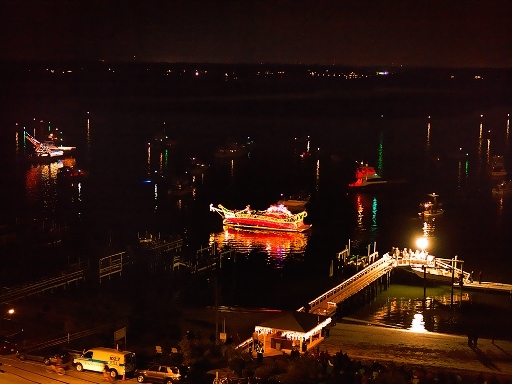 At sundown Saturday (6 p.m.), a series of flares signal the start of the lighted Holiday Flotilla with views from Bradley Creek, the Intracoastal Waterway, Motts Channel and Banks Channel. The captains will slow down, perform a 360 degree turn, and give their best show in front of the judges and sponsors reviewing stand at the Blockade Runner. The parade route ends at the U.S. Coast Guard Station Wrightsville Beach. Then, the explosion of fireworks can be seen and heard for miles around! Sunday, November 28 at 11:30 a.m. the boat captain who wins Best In Show, will be announced at the awards brunch at the Blockade Runner. The grand prize is a 5-day, 4-night trip to Vista Mar, Jaco Beach, Costa Rica, and a year’s worth of bragging rights. Winners in Powerboat, Sailboat and Crew Spirit will be announced at the luncheon. The official North Carolina Holiday Flotilla website includes all the details, ticket information, boat registration information including tips for decorating boats to win!